What if your community had to decide whether to leave their homeland forever and there was no help available? 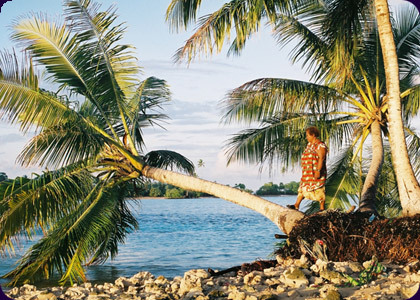 This is the reality for the culturally unique Polynesian community of Takuu, a tiny low-lying atoll in the South Western Pacific. As a terrifying tidal flood rips through their already damaged home, the Takuu community experiences the devastating effects of climate change first hand. In this verité-style film, three intrepid characters Teloo, Endar, and Satty allow us into their lives and their culture and show us first-hand the human impact of an environmental crisis. Two scientists, oceanographer John Hunter and geomorphologist Scott Smithers investigate the situation with our characters and consider the impact of climate change on communities without access to resources or support. This film gives a human face to the direct impacts of climate change in the Pacific, challenging audiences everywhere to consider their own relationship to the earth and the other people on it. Briar March is a documentary filmmaker and Fulbright scholar. Fascinated by polarizing and colorful subject matter, and angered by environmental and human rights issues, her films are diverse in style, but consistently grounded in a passionate desire to communicate. She also directed the documentary feature Allie Eagle and Me, plus a number of music videos, magazine shows and commercials. Briar has worked closely with filmmaker Annie Goldson, has a production company, On the Level Productions, with Lyn Collie and is currently completing an MFA at Stanford University. Lyn Collie is an independent filmmaker and writer. She currently teaches video for the Web and produces educational media at the University of Auckland's Business School. She has authored a number of articles and study guides on various New Zealand films and has a production company, On the Level Productions. Lyn has an honor's degree in social anthropology and a master's in documentary directing. There Once was an Island: Te Henua e Nnoho is her first feature documentary.